This book contains essays about self-effort, keeping yourself motivated, taking responsibility for your life, and living with curiosity, an open mind, and appreciation to fulfill the simple purpose of your life, which is happiness here. Much of what you accomplish in your life and the quality of your life depend upon your thoughts and actions, and this book helps you to achieve it. If you think that you do not have any control in your life or over your actions, you will be helpless and weak before the problems that life throws at you. This book empowers you to overcome your negativity and believe in possibilities and opportunities. It awakens you to your potentials and possibilities with inspiriting information so that you can cultivate and sustain your enthusiasm, energy, courage, and conviction when you need them most. With the help of the information in the book you can tap into your inner power and strength to discover the path that leads you to more success and productivity. 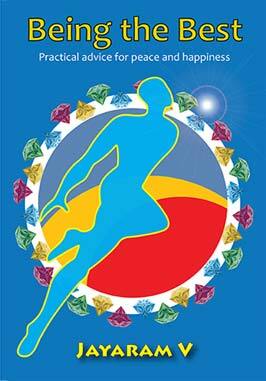 This book can help you to cultivate the right frame of mind to achieve your goals. In 58 essays, you will find an incredible amount of information to increase your inner potential and master the skills that are required to achieve success, peace and happiness. They will fill your mind with powerful and inspiring thoughts to stay focused on your goals and achieve your dreams. You will know how to take responsibility for your life, stay in control of your thoughts, emotions and destiny, and express your unique talents, and individuality. Being the Best is an extraordinary collection of the best writings of Jayaram V on transformational wisdom. You can use them for inspiration and motivation to achieve success and happiness in your life irrespective of your social, religious or professional background.